Steven (Chicagoland, United States) on 29 January 2013 in Cityscape & Urban and Portfolio. 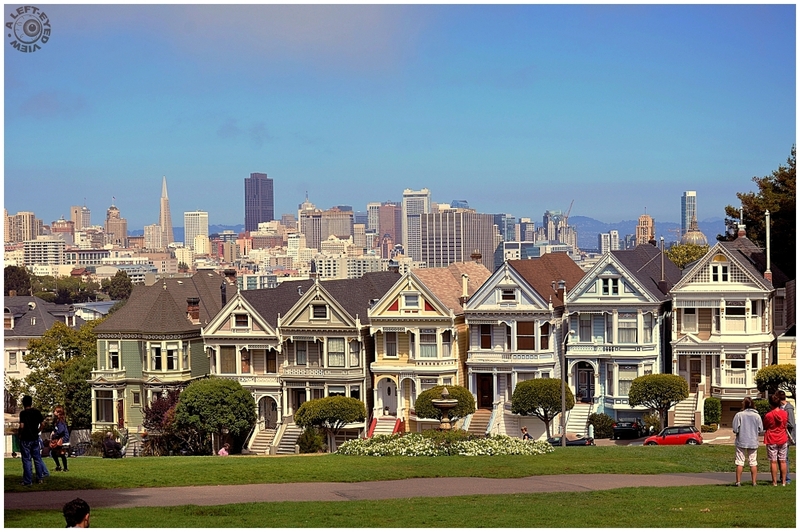 The famous Victorian homes located adjacent to Alamo Square in San Francisco, California. The City's skyline, including the TransAmerica Pyramid and San Francisco City Hall's dome (seen between the rooftops of the first and second home from the right) are in the background. The two shots of the Painted Ladies that I took back in 2008 can be seen here and here. The detail is so much clearer in this photograph. Ah, yes, they should charge a fee for photography here ! Beautiful spot. Definitely your best shot of these old house Steve. Exquisite detail and clarity. This row of houses seems to exist in its own Victorian flashback world. Such beautiful and colorful little Victorian houses. I like this one, sharp. Those homes are gorgeous - I just love the way they contrast against the skyling. Fantastic shooting, Steven! Great shot of these iconic homes, Steven. I love Victorian houses and San Francisco has long been on my must-visit list. A beautiful, iconic site, nicely photographed. Stunning contrast of the architectures of this wonderful town (in my mind for I don't know it). This is a wonderful view with such stunning level of detail and beautiful scene! A pleasure to scrutinize. Fantastisch dieser Kontrast. Super Aufnahme. Beautiful shot of a favorite place not too far (30 miles) from my home !! Six brothers (or sisters) lined up. Wonderful shot ! Beautiful! This is one of my favorite images of San Francisco. You did an outstanding job! Beautiful detail here and the buildings in the back are just excellent. Very well captured I think. Gorgeous photo of these famous houses. style. Its a famous place for that. Your D7000 certainly does this iconic scene proud. I'm happy to say this was crossed off our 'bucket list' in 1984.